Parke Muth, a veteran college admissions counselor and writer from Virginia, interviewed me recently about my opinions and advice regarding college application essays. I thought I would share the interview, which he featured on his own highly informative blog. It’s long, but I think it’s packed with a lot of great advice–if I don’t say so myself. Muth, who is a former Associate Dean of Admissions for the University of Virginia, knows the in and outs of the admissions game, and as a creative writing expert also understands more about college app essays than almost anyone else in the industry. In other words, he tossed me great questions, and even lobbed a few provocative ones! I am lucky. Maybe it’s because I am old, but in any case, I have been given the opportunity to interview some of the finest students, scholars and educators around the world and post their words here. Today you are lucky too. Janine Robinson is not just an expert in her field; she’s also one of the best resources for I know for students applying to colleges and universities. The author of three books, Janine’s words here will convince you that her approach and her knowledge could make what might be a stressed filled process turn into a journey of self-discovery that will lead, not through any magic, but with a set of useful steps, to a voice that tells a story clearly and well. Can you give us little background on how you are where you are now? By this I mean you are now the author of three wonderful books on admission essays, you work with exceptionally talented students, and you are looked at as one of the experts in the field. How did you get to this point? I also recognized that students could use the narrative writing skills I learned as a professional journalist, reporter and editor to power their essays. So I set out to find ways to teach them how to tell their real-life stories using literary, story-telling writing techniques. 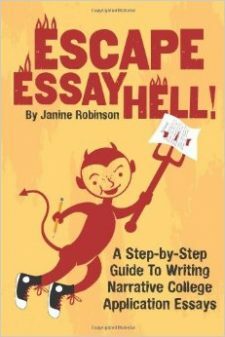 I started with my Essay Hell blog, then wrote my guide books based on my experience working with hundreds of students. Can you tell us a little bit about the genesis of your first book Escape Essay Hell? You give a ten-step approach that I think will help any student approach the process of writing an admission. How did you come up with the 10 steps? The “ten steps” are really just a way to assure students that these essays are doable if you take them one step at a time. The Essay Hell “formula” I walk students through is the exact process I use when I work one-on-one with students. I knew I could only work privately with so many students, and I wanted to offer this approach to as many students as wanted my help. Do you find that some of the steps are more challenging for students than others? Are there any which might be deemed more important than others? I believe the most important “step” is to figure out what it is you want to reveal or say about yourself in the essay. In my book, I have students start by zeroing in on a defining or “core” quality. Then they can go forward and look for real-life examples they can share that illustrate their point. This approach helps them get started, which often is the hardest part. After that, I find the biggest challenge is to take their rough draft to the next level. It’s very difficult to know what to leave in, what to take out and what to change on your own work (That’s why we have editors!) Self-editing is a skill that can be learned but takes a lot of practice. This is why I wish high schools would include more personal and creative writing in their Language Arts classes. Then students wouldn’t be so flummoxed (and stressed out) by these all-important essays—and they could hone their writing prowess at the same time. One of the things I particularly like is your emphasis on both showing and telling in an essay. Philip Lopate, who I look to as one of the great contemporary essayists, titles one of his book To Show and To Tell. Why do you think so many essay experts say show don’t tell? What are they missing? Both “Show, Don’t Tell” and “Show and Tell” are powerful writing techniques. But it’s important to know the difference. In all good writing you need both Showing and Telling. They are the two ways we communicate—by giving examples (Showing) and by explaining what they mean (Telling.) Too much of either and the writing deflates. The confusion is mainly rhetorical at this point. If possible, I think writing teachers need to drop the “Show, Don’t Tell” maxim—and pound the “Show and Tell” concept. It’s the most powerful writing tool I have ever learned. The other reason “Show and Tell” is so crucial for these college app essays is that students need to engage their reader, but also reveal the quality of their analytical/introspective/reflecting thinking. “Showing” with personal stories and concretedetails/examples is ideal for “grabbing” readers and getting them to care about what you have to say. “Telling” what they mean by exploring more abstract concepts displays clear thinking, intellectual curiosity and the ability to express meaning. Just like “Show and Tell,” you need both in effective writing: concrete and abstract. They are really the same thing. And shifting back and forth between the two give a natural spine or structure to an essay. You mention that all too often students try to impress admission officers with big topics rather than focusing on the mundane. I agree that for many students this advice is great. Could you talk a little about what you mean here? Trying to impress admissions officers usually backfires because you come across as full of yourself and reading about your personal “wins” usually is boring. Do you think they will want you at their school if they think you are not likable? They will see all your accomplishments and accolades in other parts of your application anyway. It’s counter intuitive, but choosing topics that are everyday work much better at showcasing who you are than writing about your life highlights (winning the big game, climbing a mountain, etc.) Better to pick a mundane topic (riding the public bus, singing karaoke, your missing front tooth, making kombucha, etc.) and say something impressive about your experience with it. The mundane is concrete, specific and interesting; impressive typically is grandiose, broad and intangible. As a reader, I know I relate better to topics that are humble, authentic and gritty. Even if what you did was truly impressive, I don’t want to read about how fast you ran to win the track meet, that you worked with orphans in China or that you designed a computer that won the science contest. It’s much more interesting to focus on something specific and everyday that happened during these impressive—or unimpressive—moments. And “happened” usually means something went sideways, or you encountered some type of problem along the way. Let the impressive context (the big game, the mission trip, the science fair, etc.) fall into the background of a specific moment, and go from there. While I have just said I agree with you about what you say about the effort to impress often falling flat, I do think that some of the topics on Common Ap and U Cal for example ask students to write about overcoming significant challenges. In my experience the challenges that colleges often are hoping to hear about have more to do with overcoming certain kinds of things like growing up in a low income home or having to overcome racism or homophobia. Schools want a diverse student body and there has been a lot of presses lately about how many selective schools do not have many students from low income or under-represented groups. Would you advise student in these categories to write an essay on these big topics? You, Parke, introduced me to the work of Angela Lee Duckworth, and her conviction that grit can be a more accurate predictor of success than IQs, test scores and family wealth. I believe essays that show a student’s grit can be the most effective, whether they are from a low-income or privileged background. The key to showing grit in an essay is to find a compelling personal challenge (problem) that you faced, and share how you handled it. That’s a winning formula for almost any effective college app essay, in my opinion. It’s also what makes a good story—a character dealing with conflict. And the reason narrative-style essays are the way to go. Also, you can tackle the large issues—racism, homophobia, poverty, etc.—in an essay by focusing on a specific, personal experience, incident or moment that relates to those topics. Usually the real-life story has a mundane nature, but the underlying lessons expose or reflect on the larger societal or philosophical issue. In my essay collection Heavenly Essays, one student started her essay by describing the time a woman mistook her for the wait staff at a Mexican restaurant, assumedly because the student was Hispanic. The student then went on to share how that made her feel (pissed off! ), how she thought about prejudice and the unfairness of racial disparities and what she did to address them. On the other hand, topics like divorce and death and depression don’t seem to get the same reaction from admission readers. Would you agree with this? I guess it’s what qualities the admissions officers are looking for in their students. Although those can be loaded topics and challenging to write about, I believe students should write about issues that have defined them. Again, the trick is to drill down to some specific moment or lesson within the larger issue to give the essay focus and impact. A student wrote about her parent’s divorce in one of the pieces in Heavenly Essays, but she started by describing and focusing on the weekly drive between their homes, and what she learned during those trips. Even though those commutes were about as mundane as you can get, she had a lot of insightful things to say about them. Goldilocks question: Do you think colleges and universities use admission essays too much, too little or just about right in their evaluations? Apparently, admissions officers often use these essays as the deciding factor when making final selections among the equally shiny pool of applicants. From what I understand, it’s a laborious process of elimination that often comes down to 650 words. Only schools know what they are looking for, and can evaluate if essays are helping them hit their target students. My guess is that they end up with the student body diversity or standards they seek and use these essays to reach it, but that makeup may have little to do with what they thought the students were like based on their essays. I love this idea. I think it’s absolutely crazy that students who write better (for whatever reason) have a stronger chance of getting into a school than someone who has other strengths, such as music, technology, science or art. It all depends on what colleges want to know about their potential students. If they want to know how they think, what they value and their passions (and get a sense of their personality and character), writing is a great forum to demonstrate those qualities, but not the only one. It would be up to the college to define and clearly explain what they want to learn about students, and then give them options on ways to demonstrate it. If you had to estimate how much time a student takes from step 1 through step 10 in your essay strategy what would your estimate be? It all depends on how quickly the student can brainstorm a strong topic, formulate a rough writing plan and pound out a rough draft. As we all know, there are infinite places and ways to get stumped, slow down or quit for a bit. Assuming a student is motivated, she or he should be able to pound out a strong essay (including several rounds of self-editing) anywhere from two to six hours. I find most students do best to spread out the work among a couple days, but set deadlines. It does not have to take days and weeks. It just depends on how they work, their self-discipline and outside support. The biggest obstacle is usually yourself: feeling overwhelmed, procrastinating and doubting you have something interesting to write about. Taking it step by step is a great way to work through those typical mental writing roadblocks. Do you ever have parents say that the topic their child has picked or the approach is not right? If so what do you do? Sure. I see part of my role as helping parents as well as students understand what makes a great essay. Showing them sample essays that “worked” often helps them get it quickly. A lot of parents still believe essays must be impressive and sound like academic papers they wrote in college. They don’t trust that a simple story about parking cars for a summer or smiling too much can get their kids into Harvard or Stanford. But they are wrong. I understand the concern of parents who feel so much anxiety about these essays and fear they won’t guide their students correctly, and hurt their hard-earned opportunity to attend a great college. I was there myself with my two kids. But if you have doubts, do your own research. Read up on college essays on the Internet; hire a top-notch college counselor if you can’t figure it out. In the end, you should trust your kid and your own instincts. How do you respond to people who say that experts like you provide unfair assistance to these students who have the economic means to afford help? I’m a guilty liberal so of course I wrestle with that question. What I do does perpetuate an already unfair educational system—those with means have access to the best of almost everything. They can go to private schools, afford tutors, and network among their equally privileged friends, family and colleagues, hire private college counselors, on and on. I try to justify my role with what I call my Robin Hood approach. I fill my blog with all my best writing advice and tips, which anyone with Internet access can use; I wrote three affordable guidebooks that include the exact information I use with my private clients, and I offer them for free to anyone who works with disadvantaged students. At the same time, I charge a lot ($200 an hour!) for my private tutoring. To answer your question: Yes, I provide unfair assistance to rich kids. But I also try to help those who aren’t rich. In your newly released book, Heavenly Essays you provide readers with 50 examples of students who know how to tell a compelling story. Could you talk about what you hope this book will accomplish for readers? I believe this book will help students (and parents) understand that type of topics that can make great essays (most have “mundane” topics), and also see how narrative style essay work. I wrote a brief analysis after each essay to try to show readers what specific narrative and literary writing techniques and devices were used, and why they worked—including anecdotes, dialogue, voice, sensory details, etc. It was my attempt to Show students (and parents) what works instead of just Telling them. How did you go about picking the essays? I basically asked former students if I could include their essays in my collection. Of course, I tried to pick the ones I liked the best, and provide a mix of topics, styles and backgrounds. In an attempt to get a broader variety of topics (most of my students are from privileged backgrounds), I also held an essay contest on my blog to collect essays, and 10 of these are featured in the book. Do you think that over the last several years that the topics students choose for essays have shifted much? I only work with students on their essays, and have done this since 2008. So I am no expert on what college admissions officers have been seeing or how much that has changed. I know it’s easier now than when I started to convince students, parents and college admissions counselors to go with personal topics. I don’t know how else they wrote “personal essays” in the past. I only know that since I got involved with these essays my main mantra has been to ditch the formal academic, “try to impress” essays for narrative style, “slice-of-life” essays. And that seems to be growing more and more popular among other essay “experts.” Which is great! A recent piece in the NY Times warns student that over sharing will result in a bad outcomes fro students. You advise students to stay away from certain topics. What is your view on the over sharing phenomenon? If you really want to know my opinion, I wrote a post, “TMI In College App Essays?” Yes, I think a few students might need help knowing how far to go when sharing their personal issues, but in general I think it’s better to encourage them to get out all the nitty-gritty details, and then cut out anything off-putting. I have to say almost anything must be better than a boring essay. When telling a real-life story that may have graphic, unpleasant details, it’s best to stick with the truth but try to tone down the melodramatic parts. When in doubt, ask for someone else’s opinion. Frankly, I don’t think over-sharing is one of the most worrisome issues surrounding college admissions or these essays. Yes, I advice my students to watch out for exposing their privilege. No one wants to read about your ski trips, riding lessons or trips to Fiji to surf. If nothing else, it exposes that they are oblivious to their life advantages. Often, it’s not their fault (not to point fingers but, ahem, parents?) so I just gently try to help elevate their self-awareness and flag off-putting topics. You do not talk that much about audience in your books. Do you think there is a fairly accurate way of defining who the audience is in terms of what kinds of prose they value most? I don’t try too hard to get into the heads of college admissions officers. My understanding is that they are on the younger side of me (20s-40s? on average), and are well-educated, well-meaning humans. With all my writing, I use myself as my best gauge of what’s good or bad. If I find something interesting or readable, I assume others will, too. It’s part of learning to be your own editor, and trust your ear and sensibility. I have seen how some of your readers love essays you share and others dislike the same ones. My opinion is that there are readers out there who think they are supposed to like certain types of essays, and I think it’s wise to accept that some of the college admissions officers still are that way. (They come from the same ilk as those who still believe academic essays that use words like “Nevertheless” and “Furthermore” and toss in SAT vocabulary words at every turn are somehow “smarter” and better written.) I’m hoping they are more and more in the minority. I ignore them. Your writing style both shows and tells. You have clear diction, don’t try to impress us with big words or theoretical terms, but give us a lot to think about and do. How would you describe your style? That’s so nice of you to say. Actually, I wish I “showed” more with my writing. The truth is you have to go the extra step to show in writing, to dig out examples of your points. Often with my blog posts I’m in a rush to just convey the information, and move on. So I stick to plain language and try to write more like a talk. Writing the blog has helped me find my own narrative “voice.” I highly encourage blogging for students who want to develop their own. After all that, nothing left to say. But seriously, thanks for giving me a platform to talk (endlessly) about something I care deeply about: helping others realize that they can learn to write! We are our stories. This may seem like an exaggeration, but al least for those applying to selective colleges and universities it is accurate. Numbers are important of course. Without a strong set of tough courses and high grades and SATS that predict success in a competitive environment, an essay rarely will change a decision. But given the spike in applications in the last decade from around the world, numbers are not enough. Admission readers look for a voice that will add to the incoming class. They are certainly not looking for a voice that is standardized in approach or topic. 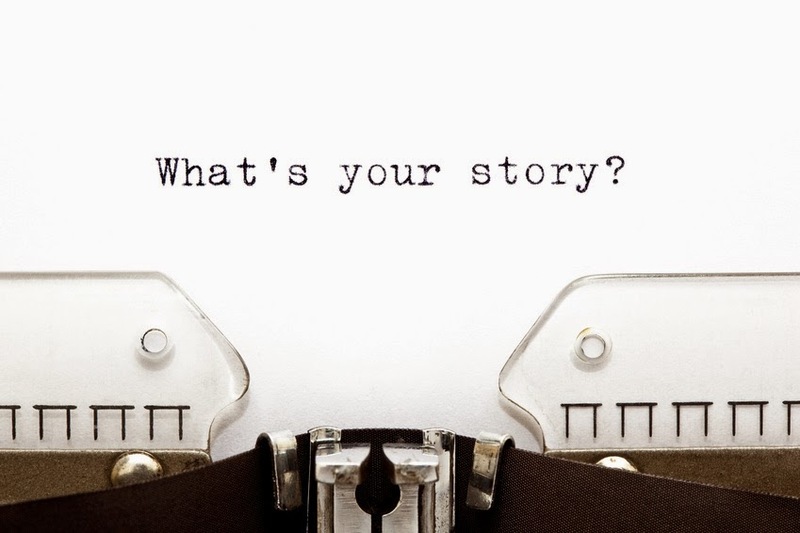 Instead, they look for a story, a narrative that encapsulates a student’s experience or view of the world in a way that compels a positive response. Jeanine not only knows this, she both shows and tells students how to create a personal statement that will permit a reader to enter a world they have not visited before. These worlds need not be exotic in any way; instead, they could focus on parking cars or getting stuck in a tree. It sometimes surprises people to know that an essay about being stuck in a tree could be looked at more favorably than an essay about climbing Everest, but it’s true. The tighter the focus, the more detail can show us the world and still leave room to tell us the importance of this slice of life. And the more a voice and the story behind and in front of it create an accurate portrait of a senior in high school, the more the essay has accomplished its goal. Jeanine’s books give students real essays to use to inspire them to find the beauty (and sometimes the dark side) in the life lived. She eschews big words and Pomo jargon and theories. She approaches her work and students with passion and clarity, which is just what students should do too. I agree with Janine that schools don’t to enough to prepare students for writing a personal essay. And I also agree that students who have the means to find a great coach, editor or consultant are at an advantage. ( I have addressed this issue of editors and ethics and help here.) At the same time, I think many schools try in many ways to reward those students who come from low income background and under-represented groups. The do worry that the people who are already stretched thin in terms of income and paying for the full cost of a college are the ones who will not have the level of sophistication and approach as some who have added help. Janine’s books, blog and efforts can help them. I applaud her efforts to help those who cannot afford hourly fees and individual feedback. Her work should be hared in schools and by colleges and universities on their websites too. Despite what some in education think, some of those doing the most to help students in significant ways are in the private sector rather than directly involved in education. I know many in addition to Janine who are committed to helping as many as they can at little or not cost. It’s about time more educators and administrators admit that people like Janine work in the trenches with students and work for many hours and that their insights and information can be useful to everyone applying to colleges. I think the inclusion of IECA in the Common Ap feedback groups demonstrates that at long last the people like her have wisdom that few others have. I do hope that CA will think seriously about including options for students to submit more than just words with their applications. It is starting to happen with college graduates and it is the world we now live in. She and I have explored Angela Lee Duckworth’s research on grit. At this point last year she was the rage among admission offices and counselors. In my interactions with Angela I think she was worried that her research was being used for things it was not designed to do. Now that she has a MacArthur Genius Grant I hope her work will explore the issue of grit in ways that will help educators, students and admission offices choose students. I will have more to say about her work and a few others who also extoll grit in an upcoming post. I would like to thank Janine for her willingness to share her insights here. I have learned a great deal from her books and this interview. Just this past weekend, I was a guest lecturer on essay writing at a highly selective university, and I mentioned Janine’s approach as a great way to actually enjoy the process of writing an essay. I have to say that in my work with students, either teaching or in some other way, most students, when given the chance to explore their stories find that it isn’t as hard as they thought and it does lead to an interest in writing that may not have been there before. I am virtually certain that this has been true of many of Janine’s students. I hope it is true for some of you who have just been inspired by her words here. Dear Janine– You are a fresh drink of cool water. Oh yes you are. As your East Coast colleague in the field– pathologically curious about how the liberating force of good writing gets passed down to those who need it most, I can say that your advice is the soundest I have found in a single place. Your Robin-hooding is a magnanimous platform for fairness. I salute you from Brooklyn, dregs of Jasmine tea bearing witness. @Sara. Wow, that was the sweetest thing I’ve heard in a long time! Thank you so much! I actually had to read this comment out loud to my husband. I checked out your web site and love your de-stressing approach to these essay on the other side of the country. I practice yoga and believe whatever you can find that helps you feel whole and centered can also help students get through this ridiculously stressful time. Maybe we will get to meet one of these days! Let me know if you are ever in Laguna Beach and we can get some tea! Namaste! !